Chicken Pakora with bones is an absolutely delicious chicken fritters which can be a perfect non-veg starter in your lunch or dinner. 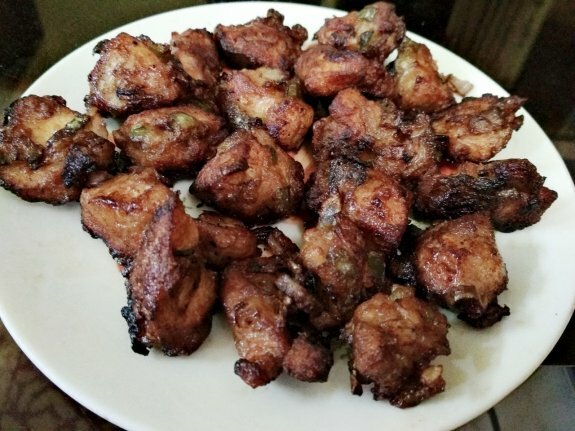 So, learn how to make this crunchy and delicious amazing chicken pakora recipe at home. You can also have this as your snacks partner with tea or coffee. 1. Take a big bowl and beat the egg. Now, combine the chicken, ginger garlic paste, soya sauce, tomato sauce, corn flour, salt, all purpose flour, sugar and lemon juice. Mix everything well. 2. Add chopped onions, capsicum and green chillies into it and again mix well. Keep it aside for atleast 30 mins. 3. Heat oil in a deep bottom pan and fry the marinated chicken pieces one by one until chicken cubes are turn into golden brown in colour. 4. Serve the fried chicken pakora hot with mint chutney or tomato ketchup.